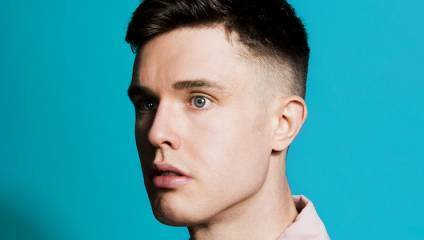 We caught up with the award-winning comedian Ed Gamble as he embarks on a UK tour of his fifth solo stand-up show 'Blizzard', about the eternal struggle for identity and getting conned by a guide dog. EG: The title comes from the fact that at the beginning of last year I was on a lads’ holiday – when I say lads’ holiday, it was three other comedians, it wasn’t laddy at all – I was on a holiday with three other comedians in New York, and there were some horrific snow storms and we got stranded. Now, it’s not so much about the holiday itself, it’s about the fact that we got stranded and that it made it into the BBC news, and people’s reactions to that. So that’s where the title comes from but there’s also various other stories about what’s going on in my life, including my Dad retiring and getting a cat, which I can’t tell you too much about – it sounds boring, but there is a twist. What isn’t laddy about three comedians on holiday? EG: Well we’re not particularly laddy comedians – I mean there are comedians that you’d probably brand as lads, but it was me, James Acaster, John Robins and Lloyd Langford – there were a lot of plans to go out late, and then it would always end up with us watching Netflix in our Air B’n’B and one by one falling asleep on the sofa before midnight. What do you watch on Netflix, do you watch other comedians? EG: I do, I think I’m quite unusual amongst comedians who’ve been going for as long as me, because I still love watching comedy, I love watching stand up. I’ll go to the Edinburgh Festival and watch 4 or 5 shows in a day sometimes. I still love it, and there are quite a few comics who’ll say they don’t laugh at things any more, they’ll just nod and go “yeah I can see how they did that”. I’ve not lost that joy of watching other comedians do what they do. So yeah, I’ll watch stuff on Netflix when I have time and I’ll go and watch shows – I’m going to see James Acaster in London tonight. Blizzard sounds quite eclectic; what kind of things inspire you? EG: Silly stories, and anything in my life that feels slightly off kilter or unique to me. It’s tricky – eclectic is probably the right word in the sense that I think there’s been a real trend for shows to be about one thing, or telling one story or making one point, or being themed. And that’s never appealed to me. There have been some amazing shows like that but it’s not how my brain works, I can’t sit and write an hour from scratch about one thing, and one story. It’s everything that’s occurring around me that I’ll try and jigsaw together into one show, which makes it – I think – a more entertaining experience for the audience. I think they can tell I’m enjoying it a bit more. You’ve touched on various parts of your own life – being stranded in New York, your diabetes – is everything for grabs when you’re writing? EG: If it’s just about me, I don’t think I have any buffers, really. Because also, I think it’s my job to find out what’s unique about me and tell an audience about it, because there are so many comedians that you need something to talk about that’s personal to you. I think it’s just about finding a funny way of doing it really. So take diabetes, I could have taken it down some depressing roads, but I think I’ve found some funny angles on it. As long as I can make it funny, I’m happy to talk about it. I wouldn’t talk about other people in my life, necessarily, if it was revealing or too personal. But if it’s me – that’s my job. It’s my job to be me, and lay everything bare. Truth and personal experience seem to be quite powerful ingredients for comedy – what do you think? EG: I think that’s about uniqueness – truth and personal stories are magnetic and compelling to watch. You feel like you have more of a connection with a performer if they’re being vulnerable and exposing something about themselves. Personally, when I talk about diabetes I always try and keep it funny, like, I’ve seen some amazing shows where people are honest and they sort of forgo jokes in those bits, which makes for a unique viewing experience but I don’t think that’s what people come to see me for. I love making audiences laugh; I don’t want those silences where you lay your soul bare. I don’t think my audience want that from me either. So I’ll draw on personal experience but it’ll never be at the expense of trying to find the biggest laugh. You’re doing 44 dates on your tour; how do you keep engaged with the material? EG: It’s not too bad, I know comics who end up doing 100, 150 dates on the same show… I’ve done it in Edinburgh, but at the Edinburgh festival you only get an hour slot, whereas on tour I’m doing two halves, so the show naturally loosens up a bit and things get extended. That’s what I really like about touring – I’ll still find new bits every night because I refuse to do the same stuff exactly as it is every single night, I’ll always new ways of saying it, and I chat to the audience a lot. The main stuff is the same but there’ll be a little twist on every night, and that makes it fun and keeps it fresh. And this year I have a tour manager, who’s my friend Paul, who’s also my technician in Edinburgh, so that means I don’t get too lonely. That’s the only issue with touring – if you don’t have a support act, or a tour manager, which I did last year, it’s not particularly fun. Any audiences you’re especially looking forward to? Or dreading…? I try not to worry about things up top, when I go to places, because whenever I’ve done that in the past I’ve always proved wrong. There’s always an old myth in comedy – for example, Liverpool, people say audiences there are difficult because they all think they’re funny and like to chip in, and then I went to Liverpool last year and had an absolute ball! They were a really lively audience but the perfect level of lively. Bristol is somewhere I look forward to performing as well, I’ve always enjoyed it and I don’t think I’ve ever had a bad gig there, they’re very comedy savvy and up for it. There’s nowhere I’m dreading because I will be proved wrong. For more information and to book tickets, visit Ed's website.